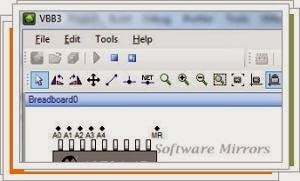 Virtual Breadboard or 'VBB' is a development and an emulation environment for embedded applications that use microcontrollers featuring Makeable Breadboard layouts that bring your designs to life. Virtual Breadboard is an integrated Breadboard circuit emulator and microcontroller development environment. Inspired by Microsoft Visual Studio, VBB aspires to be an Object Orientated Hardware development tool transforming the task of hardware design into software. Built In Examples ship with the Virtual Breadboard default images. Learning by example is the best and easiest way to quickly get started. Navigate the example tree and select from over one hundred examples which illustrate the capabilities and supported components and libraries. Integrated Development in Virtual Breadboard means you can design software and hardware side by side. Design Sheets are drag-and-dropped from the project tree into up to 3 view panes.